What It’s About: When Hedley Lamarr (Harvey Korman) convinces the Governor (Mel Brooks) to appoint Bart (Cleavon Little) sheriff, it is to continue his plan to ruin the town and make way for the railroad. Hedley thinks Bart, a black man, won’t be able to unite the town, but along with a drunk ex-fast shooter deputy Jim (Gene Wilder), Bart proves to be a more dangerous opponent than Hedley imagined. Why Watch it Today? : Writer/director/co-star Mel Brooks was born today in 1926. 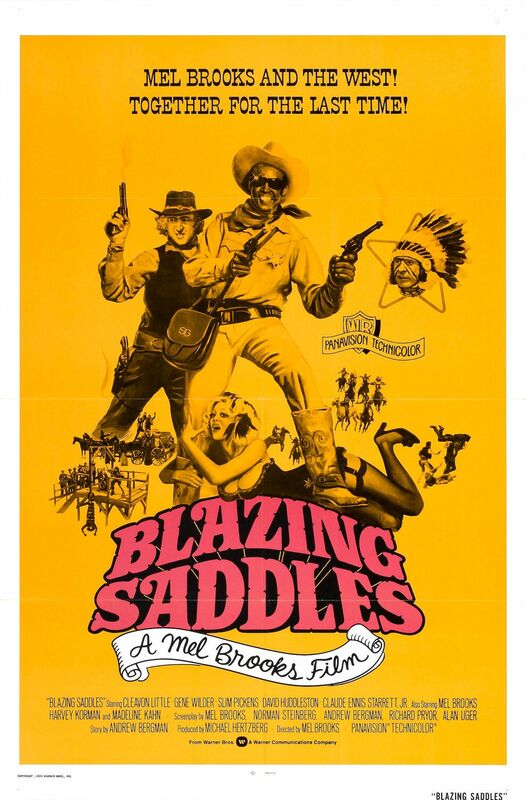 Blazing Saddles was Brooks third film (after The Producers and The Twelve Chairs) and the first of many films he would make parodying various genres. Blazing Saddles is a dead on parody of Western clichés and is Brooks at his best. This entry was posted in Comedy, Movie of the Day, Musical, Slapstick, Spoof, Western and tagged alcoholic, Alex Karras, Best Film Editing Nominee, Best Song Nominee, Best Supporting Actress Nominee, Cleavon Little, Dom DeLuise, Gene Wilder, George Furth, Harvey Korman, John Hillerman, Madeline Kahn, Mel Brooks, musical interlude, railroad, Richard Pryor, sheriff, Slim Pickens, Warner Brothers. i never saw that poster before…only saw the poster with brooks’ face on it, in multi-color.